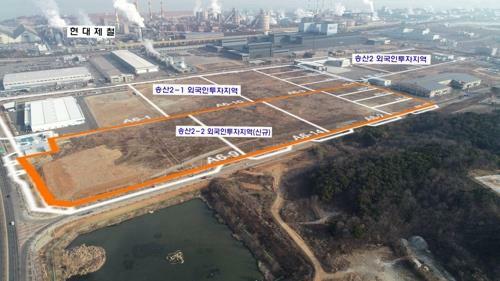 (HONGSEONG=Yonhap News) The foreign Investment Zone (complex type and individual type) in Chungnam area has been found to be the largest in size in Korea. The foreign investment zone is an industrial site which is formed by the government and local governments buying the land jointly and renting out to foreign companies at discounted rate. They are categorized into individual-type, complex-type and service-type. In the individual type foreign investment zone, only one foreign company with more than USD 30 million investment is eligible to be an occupant. In contrast, in case of the complex-type foreign investment zone, the local government makes the rental site and provides to many number of foreign companies to allow smaller-sized enterprises to move in. The service-type investment zone is established to attract foreign companies in the service field, including financial, R&D, and knowledge industries, with the designation given to the buildings, currently existing only in Seoul and Daejeon. The number of the complex-type foreign investment zones in Chungnam province is six, including Cheonan, Cheonan 5, Inju, Songsan 2, Songsan 2-1, and Songsan 2-2, the highest in the country. The total area is 1.428 million square meters, accounting for 17.4 percent of the total area (8.198 million square meters) nationwide. The number of individual-type foreign investment zone amounts to 19, the largest in the country, with total area of 831,000 square meters. Noticeably, the investment attraction results have been outstanding (excluding Songsan 2-2 which was notified and designated last month), as the occupancy rate in five foreign investment zones combined recorded 83.9% with 69 companies residing. A provincial government official said, "The fact that Chungnam has the largest number of complex-type and individual-type foreign investment zones illustrate the region's attractiveness as an investment target," adding that "we will endeavor to resolve company's difficulties and improve regulations to attract more foreign invested companies in the future."